Like in beginning of every year Top vBlog 2015 Voting started.This is time of the year when your readers, followers, colleagues, lads etc. 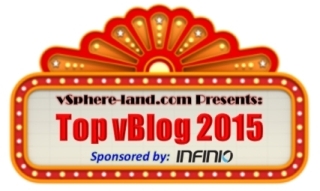 evaluate your work and vote for your blog. Although vbuffer.com is only few months old, with only few articles and readers, I decided to give it try and run for niche in category “New Blogger” .I would be happy and appreciate if you support me and give a vote for my blog :-D. In other hand, I commit to deliver more interesting and quality content for upcoming year . Likewise , as one of the Co-Founders, here is good place to mention about my dear fellows TheVirtualists. Over the past year they proof that can create really strong relationship with their readers and provide interesting quality articles. I strongly encourage you to give your vote and help for @TheVirtualist blogging platform and help them get to fair place in overall blog ranking.